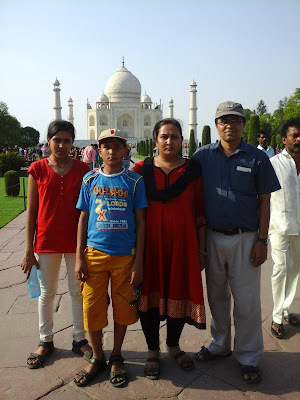 I would like to share my journey to Agra. As you all know, Agra is famous for one of the seven wonders of world – The Taj Mahal. When the word Taj Mahal comes in mind, it reminds us the love of the Mughal Emperor Shah Jahan and his beloved queen Mumtaz Begum. When it was finalized that we are going to visit the Taj Mahal, I started to read the travel blogs and wrote some useful tips which I thought were relevant for this journey. My husband booked the railway ticket from Patna to Delhi. One can opt for Domestic Airlines from Patna to Delhi. But we opted train for this journey to see the country side. After staying two days in Delhi, we had to go to visit the Taj Mahal. On proposed day we took our train from Patna to Delhi. This journey was pleasant. 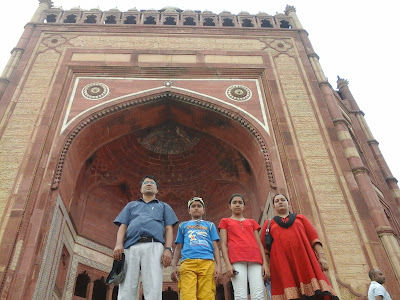 After resting for two days in Delhi, we took our train to Agra, i.e. Taj Express from Hazrat Nizamuddin Station. It takes around 4 hours to reach Agra. We were four people - me, my husband and two kids. 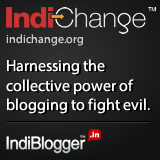 When we reached Agra station, we saw many taxi drivers and agents were asking for a cab. We met a person who was very nice in his talks. I booked his cab for our journey. His name was Anwar. He was not only a cab driver for me but also our guide for the whole journey. 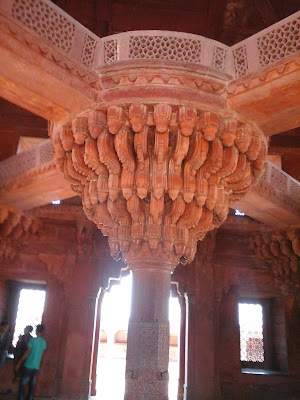 He suggested us to first visit Fatehpur Sikri. It is around 40 km away from Agra City. We reached there by 12 o’clock. It the midway, we had our lunch. 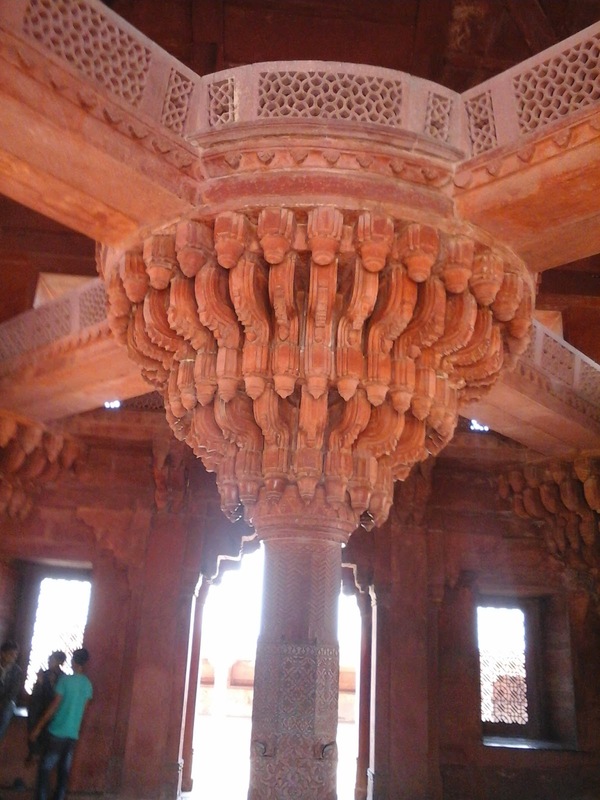 In Fatehpur Sikri, there are many monuments to visit. Buland Darwaza, Dargah of Saint Nizamuddin Aulia, Panch Mahal, Palaces of Jodhabai and other begums, etc. We came back to Agra around 5 o’clock in the evening, so we checked in a hotel near to the Taj Mahal. On next day we went to see the world famous monument – The Taj Mahal. When we entered the campus of the Taj, we were surprised to see the huge entrance gates. Oh My God! What a beautiful monument! We were mesmerized when we saw the Taj Mahal first time. Really its wonderful. No one can believe that it is a 450 years old structure. When we entered the main building of this monument, it was a onetime experience. Now I could understand why people around the world, wish to come and visit the Taj at least once in his life. They took International Flights from around the world and came India to see this tomb of love. The four minarets look alike from any side, either from main gate side or from Yamuna river side. We were fortunate that the main tombs of the emperor and empress were opened. The designs and carvings on white marbles indicate the emperor's love for nature, flowers and arts. Its campus is about 42 acres in area. It is said that the best quality stones and marbles had been used to build this tomb. The white marble dome that surmounts the tomb looks great. The Taj Mahal is a UNESCO world heritage site. I would suggest everyone to visit this spectacular monument at least once in life. I can say yatra is a mode of entertainment as well as knowledge. Really, this was my Ideal Yatra.